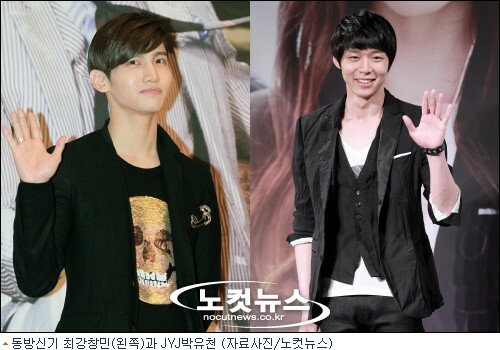 JYJ (Park Yoochun, Kim Jaejoong, Kim Junsu) confessed their honest feelings about TVXQ’s U-Know Yunho and Choikang Changmin. 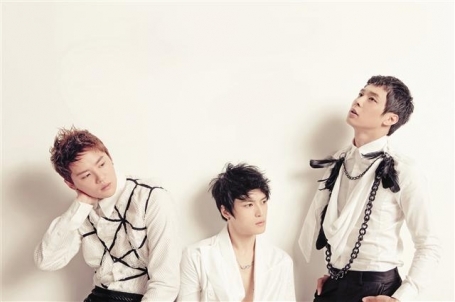 Meanwhile, JYJ, having released their first Korean album ‘In heaven’, will be holding their first concerts in Europe as they stop by the Palau Sant Jordi Stadium in Barcelona, Spain on the 29th of October and the Tempodrom in Berlin, Germany on the 6th of November. (Jaejoong, 12:17am KST) Yoochun always keeps his neutrality. Placing himself in the middle of his members, he always watches over all of them. So the members never have a chance to think that they’re alone. He has the most free soul of all of us and he shares that resonance with us so that we all feel security within troubled times. (Jaejoong, 12:27am KST) I don’t know if I can say this or not.. but I miss Yunho and Changmin too.. No matter what anyone says, they’re our members and because I know them better than anyone else.. Though people may say that I’m speaking nonsense.. It’s been a while, but I miss them. JYJ’s Park Yoochun and TVXQ’s Choikang Changmin kept MBC’s staff on their toes as they filmed for their respective shows on the same day and time with just one wall separating them. On the 22nd, Park Yoochun filmed for ‘Miss Ripley’ on set at the MBC Dream Center in Ilsan, Gyeonggi-do. He was following a rigorous schedule of filming for the drama in the morning in the MBC building and heading out in the afternoon to film in Gangnam. Next to the indoor set of ‘Miss Ripley’ was the set of MBC’s ‘Come to Play’. On this day, many SM Entertainment singers were present after completing their ‘SM TOWN Live Tour in Paris’ performance in Paris, France. Choikang Changmin was present to represent TVXQ on ‘Come to Play’. Fortunately, it was later found that the two did not run into each other due to their busy schedules. But as Park Yoochun and SM Entertainment representatives have not met in public since the 2009 lawsuit, MBC staff later reported that they were unable to hide their nervousness as they were kept on their toes. Since Park Yoochun began singing as a member of JYJ, he has been unable to appear on variety shows. Though the lead roles of ‘Miss Ripley’ tried to appear on ‘Come to Play’, the plan was canceled due to doubtful reasons. Even ‘Section TV Entertainment News’ has dropped out of publicizing its own broadcasting company’s drama, which has never happened before. StarQ10: What are the unusual records that TVXQ have set? 110622 ‘StarQ10′ What Are The Unusual Records That TVXQ Have Set? What records have Hallyu stars TVXQ set that have surprised the world? On the 25th, SBS’ E!TV ‘StarQ10′ made an investigation into TVXQ’s unusual Guinness World records as well as their overseas activities. In 2008, TVXQ won the Guinness World Record for the biggest fanclub in the world and in 2009, they won the record for being the most photographed celebrities in the world with over 500 million photos taken of them. During their Japanese tour, they set a record by selling out their tickets in a mere second. They surprised everyone when it was found that they were so active overseas in 2004 that they traveled the equivalent of 80 trips around the world. TVXQ even proved their popularity in China when they received 136,031,908 votes in a popularity vote on a Chinese site. A Russian figure skater (Ilia Kulik) even used one of TVXQ’s songs for his gala show. ‘StarQ10′ staff plan to call overseas Korean residents to listen to the extent of K-POP’s popularity and the Hallyu Wave. In this episode, questions for ‘SM idol groups who are redrawing the Hallyu map with K-POP’ will be revealed in six keywords. The episode of SBS’ E!TV ‘StarQ10′ will air on the 25th at 2:30. Sunglasses are already a staple for completing airport fashion, but celebrities are now adding on another finishing touch in the form of a backpack. Let’s take a look at what stars are wearing to the airport nowadays. JYJ’s Park Yoochun, who cannot be left out when talking of the fashionistas of airport fashion, can be seen completing his look with a backpack. 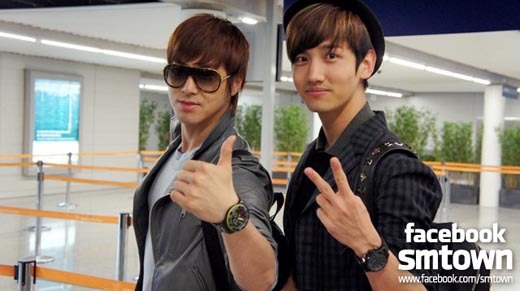 In the airport to head out for their concert in France, TVXQ were also seen with backpacks. Choikang Changmin especially drew the attention of many with the studded design of his backpack.